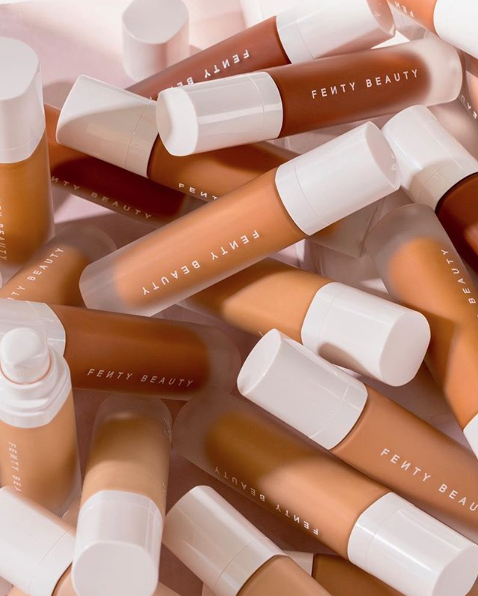 Since launching last September, Fenty Beauty’s Pro Filt’r Foundation has had the beauty community shook. Beauty fans immediately fell in love with their diverse range of shades. We love viewing viral videos from ecstatic brown beauty gurus who’ve finally found their perfect match and those that show women (and men!) raving after finding a shade that helps cover discolored skin. Most recently, a man by the name of Darryl posted a heartfelt review on Fenty’s product page about the foundation. In it, he highlights how his wife Jeanelle, who has severe facial scarring, was able to find a foundation that perfectly covered her scars. His review went on to say how since using the foundation, he’s seen his wife’s confidence go through the roof. Having recently celebrated a 16th wedding anniversary, Darryl says that his wife used the foundation before they went out to celebrate and Jeanelle beamed at how perfectly it matched her skin and how easy it was to apply. In his review, he wanted to personally thank Rihanna for creating a product that has helped, “the [love] of my life get through the struggle of her affliction”. The folks at Fenty noticed Darryl’s emotional review and took to Twitter to help locate the couple. Within hours, the Twitterverse helped the brand find both Darryl and Jeanelle. We can’t wait to see what surprise Fenty Beauty has in store for the duo, and we’re glad to hear that Fenty is out here changing lives.